Obviously election politics are here, first Israeli and Iranian officials threatoned complete destruction of the other, now Clinton has gotten in the act, I guess she is saying even if Iran does it first then we will take care of them!! To me this is just crazy, policticians should not be throwing around this kind of venomous language, Full story at the end of the post. One fun thing about following the NBA Lakers basketball is during the home games checking out to see who are the hollywood stars in attendance. 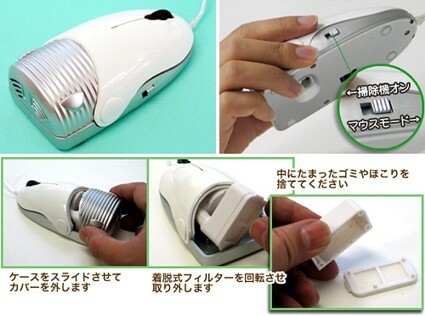 Believe it or not, take a laser mouse with scroll wheel and combined it with a miniature vacuum cleaner the WALA! you have the new Vacuum Mouse. Its got a power switch on the side for turning the vacuum on and off. The dust reservoir can be accessed in the back-end of the mouse. Now you will be able to clean your mousepad with a click. Nubrella a no handle umbrella, a fashion mistake? Well this is what the site Nubrella.com suggests: Introducing nubrella, the ultimate weather protector! We know the sensitivity of Iranians to have the Persian Gulf be reffered to with its correct name. Still this news item caught my attention on how the Iranian government refused to respond to what US had filled with the Swiss embassy in Iran, because the recent naval incident was reffered to as Gulf and not Persian Gulf, full story at the end of the post. Pictures from a tournoments played last year for national championships in Saghez. 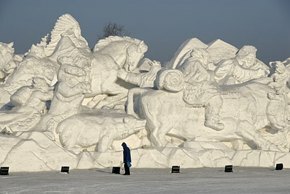 This was the first national sports event of its kind ever to take place in this small city. Everyone is so worried about how Irans nuclear power plant ambitions is not a good idea as it might lead to nuke weapons (which none of us wants) then consider how Pakistan and Inida not only have the plants but also the bombs. Well guess what now US is selling $20 Billion worth of weapons in the area plus France signs a nuclear coorperation agreement with UAE. How this is going to make the region safe I have no idea. I hope its not all about money... browse through the news items below for the latest. Two interesting stories from this past week, Universities of Holland have stopped accepting Iranian students claiming due to nuclear technology concerns.Secondly a story on how the US treasury has blacklisted a top ranking person from the revolutionary guard called Ahmad Foruzandeh. Indias well known vehicel maker that is in the market to buy Jaguar & Land Rover from Ford Motors, on Thursday unveiled Nano its low-cost small car. The car is a hatchback with a 624cc engine, its price at 2,500 dollars is half that of the current cheapest car in the market. French Actress Juliette Binoche visited Kashan with Abbas Kiarostami. She is to star in one of his films shortly, view the photo essay below.